List 'likely to face petitions from the Left,' sources claim, but add that previous opposition during 19th Knesset elections was rejected. Former MK Dr. Michael Ben-Ari's Otzma Yehudit party has released its list for the 20th Knesset Monday, ahead of the Thursday deadline for the March 17 elections. Party sources say that the list will likely result in a lot of petitioning from the left against it, as Lehava was recently the subject of an Israel Security Agency (ISA) crackdown and several activists were arrested. 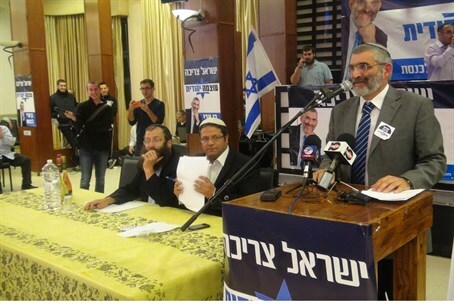 "It should be mentioned that a petition was filed in the previous Knesset against the list that included Ben Ari, Marzel, and Ben-Gvir, but the Supreme Court rejected it," the source noted to Arutz Sheva. The source added that additional candidates, if needed, will be added to the list based on a high faith in, and loyalty to, the Jewish people and the State of Israel.